Longtime readers of my blog will remember that for about two years we switched rooms with the kids, meaning that the four boys had our master bedroom and we had one of the smaller rooms. We rearranged again just recently, but the change is not yet complete. Part of the problem is that I have Blogger’s Disease, which means that if there is something blog-worthy that should be photographed, I don’t want the opportunity to pass me by. 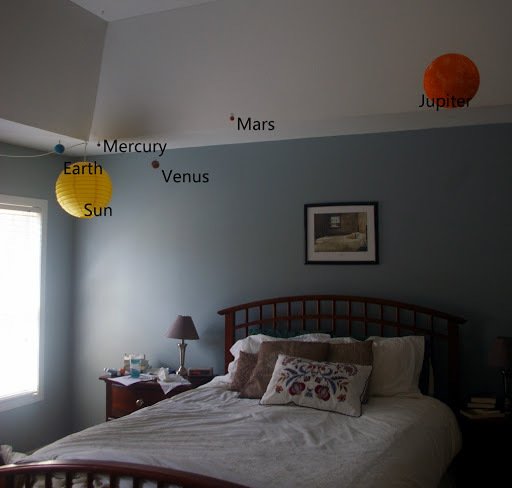 The back story on the photo: while the boys were in the master bedroom, it was a spaced-themed room. We had a solar system hanging from the ceiling. Now that you’ve all seen it, I think I’ll take them down. This entry was posted in homekeeping, humor, photos. Bookmark the permalink. Not only have I seen it, I now have that song going through my head.